Enderby Parish Council's website delivers information about the Parish Council, its work and involvement in the local community. 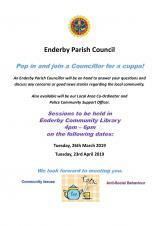 The Parish Council is the first tier of local government for Enderby and provides some local services for its parishioners. It strives to make Enderby a better place to live, work and visit. On this website you will find information about how the Council conducts its business and what it does. Use the keyword search box or browse the site to find items of interest. If you are unable to find what you are searching for or would like to recommend any improvements to this website please contact us. 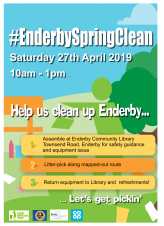 Enderby Parish Council have joined in with the spirit of the 'Great British Spring Clean' and organised a litter-picking event for Saturday April 27th. HTML5 validated. WCAG compliant. Page generated in 0.257 seconds.